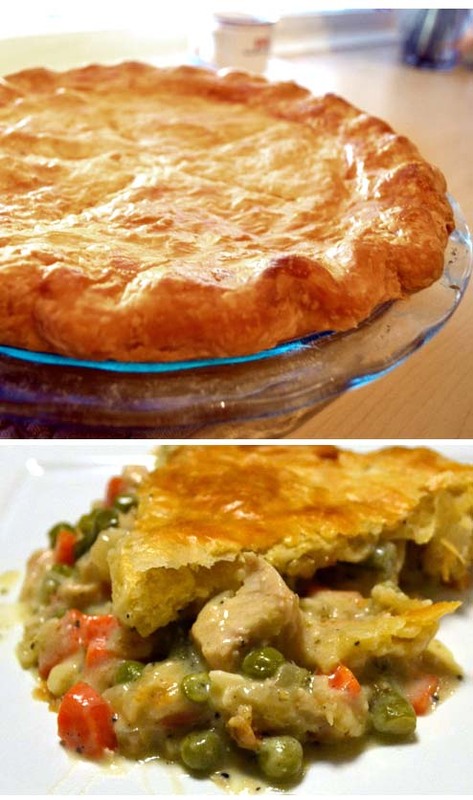 Made this chicken pot pie by following the recipe in the video below. No butter and no cream were used. Surprisingly delicious! Mix chicken stock and milk in a bowl. Add flour and whisk. Set aside. Over olive oil, sautee carrots, celery and onion. Cook and stir for around 2 minutes. Then add green peas, chicken stock sauce, salt and pepper. Filling should thicken. Pour filling in a 9-inch pie pan. Set aside. In a medium bowl, make crust dough by mixing flour, salt, olive oil, and milk. Stir until doughy. On a flat surface, layout wax paper and flour surface. Place another waxpaper on top of the dough and flatten with a rolling pin. Brush egg wash on the rim of the pie pan. Cover the pan with flattened dough crust. Trim overhanging crust as necessary and fold the edges neatly. Brush the top surface with egg wash.
Poke random holes on the surface with a knife so steam escapes inside the oven. Remove from oven. Let cool for 10-15 minutes.